You can never go wrong with the classic jump rope. It's a simple toy that can entertain children for long periods of time. Even better, you can make one out of items you probably have lying around the house. It's a quick and easy craft project. So pull those plastic bottles out of the recycling bin and make a jump rope with me. Here's the bottle I started off with. Optional - you can have your child decorate the bottles with stickers. 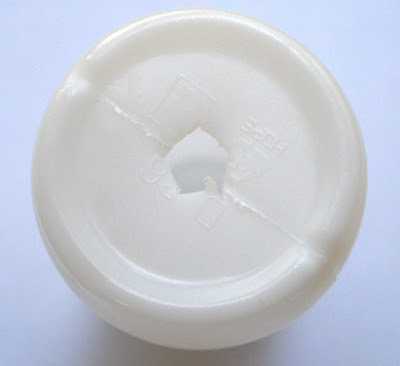 Cut out a hole with the exacto knife in the center of the bottle. It should be slightly larger than the circumference of the rope. Take apart a fake flower. 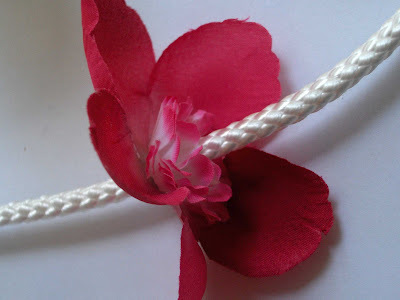 Thread the flower onto the rope one petal at time. 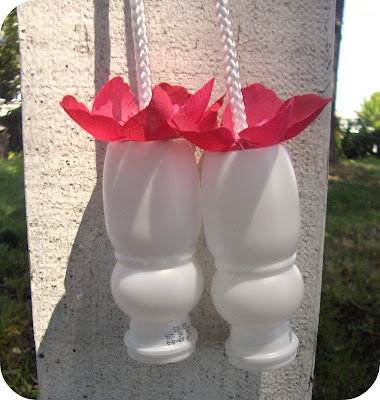 Thread the plastic bottle onto the rope next. Tie a knot at the end (refer to picture). 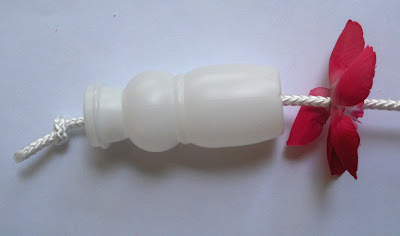 Pull the rope tight so the knot is at the end where you cut the hole out of the bottle. 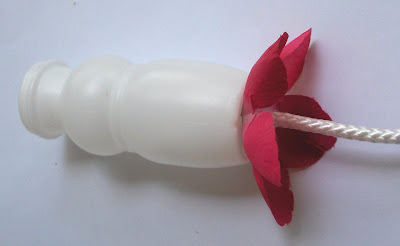 Glue the flower to the bottle. Repeat on the opposite side of the rope. Done! Here's a childhood blast from the past, Miss Susie jump rope rhyme. 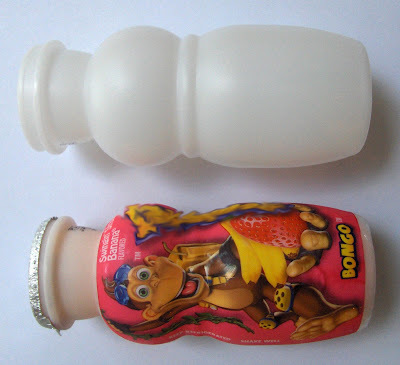 Anyone else remember this? Wow--did that rhyme bring back memories for me! Cute idea, love your site! I like your jumping rope better than what i can buy outside. It suits your pretty girl so well with the cute flowers and nice handles. I loved miss susie when I was little! That jump rope doesn't even look like it is made of stuff just laying around the house! Great job! Wow! thats so cute. An amazing way of recycling and much better than store bought too. This jump rope is so cute! Oh my gosh I've been trying to remember the last part of that rhyme for forever. Thank you! I used to love that one with it's "dirty" words! I've never heard that rhyme. I remember Ms. Mary Mack, Mack, Mack. That's about it, and I don't even think that was used for jumping rope. I remember Ms. Mary Mack! Another great rhyme from childhood. Loved this idea have to make a few .Thank you so much awesome tutorial. This is such a great craft! When my babe is a little older, I'll be making her one. :) Thanks! Oh Jessica! You have fantastic ideas for recycling. Thanks for sharing! and I was planning to buy the book of jump rope rhymes from amazon, I'll have to come back here. I love the jump rope idea. that's so cute with the flower too! As far as the rhyme, it takes me way back, another one was something about "Open up the barn doors, kick out the hay, we're the girls from the U.S.A.". Oh I miss being a child! Wouldn't the hole you punch in the bottle cut the rope eventually? Have you noticed this and come up with something to stop it? I haven't noticed a problem yet, but you have a good point. I would line the hole with a few layers of masking tape to make it smooth. That should prevent the rope from tearing. 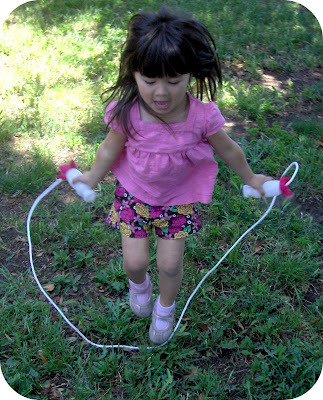 I used to LOVE to jumprope! Love the old memory...thanks! 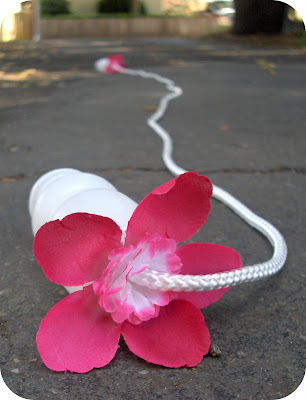 Great idea for the jumprope! Your daughter is very cute. Just nice for this pretty jump rope. Really great idea! I'll try to do this for my children! Thank you for your good and interestig posts! Wow, I didn't know there was a part after the boys zip up their flies. That is were we always ended it. I used to sing that song all the time! and that jump rope idea is the best! WOW this is so cool!!!!! LOVE love love this! We've even got yogurt drinks on hand!! Very cute idea! on a side note, you can use a little GooGone to take off the black ink stamp on store bought containers too! this is nice for my nieces, thanks for the idea. Hello I am a GCSE student doing Up cycling in ICT. Can I please use your webisite for my work? (fast) 1, 2, 3, 4, 5 etc till the person got out.